Make the most of your Panasonic telephoto lenses by using this DMW-TC20 2x Teleconverter to magnify the image and extend your reach by 2x. Designed for select Panasonic Micro Four Thirds lenses, such as the Leica DG Elmarit 200mm f/2.8 POWER O.I.S., this teleconverter features complete communication between the lens and camera, retaining critical metering, autofocus, and image stabilization functions. Additionally, it is splash, dust, and freezeproof to match high-end telephoto lenses and camera bodies to ensure optimal performance in less-than-ideal weather conditions. 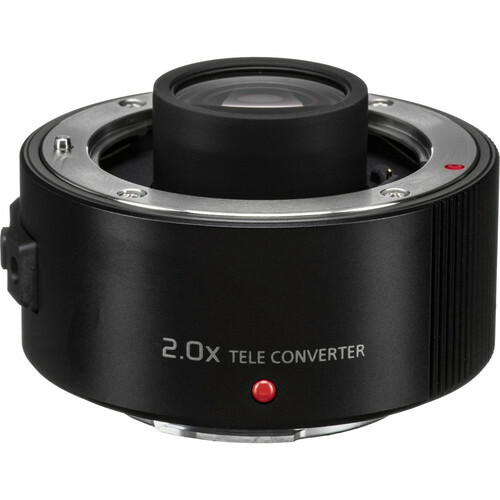 DMW-TC20 2x Teleconverter is rated 5.0 out of 5 by 3. Rated 5 out of 5 by Dwight from Partial compatible with Olympus I had previously said it works with Olympus. It does, but the image stabilization does not recognize the teleconverter. The 300 mm lens gets IS for 300 rather than 600 mm. It still works well, but you do need a higher shutter speed. Rated 5 out of 5 by Dwight from Fits Olympus 300mm f/4 It does fit the Olympus 300mm. The auto focus and exposure are working properly. I have not critically evaluated the picture quality, but have high hopes because lens and teleconverter seem to work quite well together. Olympus and Panasonic continue making compatible products that work well together. Rated 5 out of 5 by Mary Jo from Teleconverter I finally received the lens and was able to use the teleconverter. All that it said it was and more! Does the TC change the minimum aperture? Yes teleconverters increase the focal length/zoom range and the minimum aperture. Is this Teleconverter works with the macro 60mm Olympus? It is not compatible. The protruding element of the converter does not fit the Oly 60mm body. will this work with the Leica DG Vario-Elmar 100-400mm f/4-6.3? No the Panasonic DMW-TC20 2x Teleconverter will not work with the Panasonic Leica DG Vario-Elmar 100-400mm f/4-6.3 lens. The only lens listed in our Product Highlights, Compatible Lens list, and Panasonic's website is the Panasonic Leica DG Elmarit 200mm f/2.8 POWER O.I.S. lens. The 100-400mm f4-6.3 is too dark of an aperture for use with a 2x teleconverter and would not allow the camera, and its focusing system, to see enough to focus and function properly. Is there any chance that this could work on the Olympus 300mm? I had previously said it works with Olympus. It does, but the image stabilization does not recognize the teleconference. The 300 mm lens gets IS for 300 rather than 600 mm. It still works well, but you do need a higher shutter speed. Ive read that the tele-converter is not compatible with standard MFT lenses because of the protruding element of the converter. My question is will it work if you attach an automatic extension tube between the converter and the lens to allow for the protruding element? It has a little metal bar on the lens mount. This prevents it from being mounted on any lens that doesn't have a corresponding hole. I have considered removing the bar with a Dremmel tool. Does B&amp;H have updated (as of Jan 2019) info on whether this teleconverter will work on the LUMIX G LEICA DG VARIO-ELMARIT Professional Lens, 50-200mm, F2.8-4.0? Panasonic's web site says it will on their listing for the 50-200 lens, but on their listing for the teleconverter they only specify compatibility with the Panasonic 200mm f2.8 prime. Yes, as the other person said it will work on the 50-200mm. I bought it and tried it, but at f8, I did not like the results. I found the Panasonic 1.4X online, and I am much more satisfied with the results. Will this work with the Olympus 12-100mm f/4 IS ED PRO? Is this compatible with only the 200mm lens? It's compatible with the 200/2.8 AND the Panasonic/Leica 50-200mm f/2.8-4 lens. It is not compatible with any other lenses.